I had a lovely time yesterday spending the afternoon with Hobgoblin and two blogger friends, Suitcase of Courage and She Knits By the Seashore. We took our bikes out to eastern Connecticut to go visit Buttonwood Farm, famous for its sunflowers. They have been planting and selling sunflowers for several years now, and all proceeds go to the Make-a-Wish foundation. After getting our fill of the flowers, we rode up and down some hills for a while, and eventually made our way back to the farm, where they sell ice cream. I had what I think is called chocolate brownie batter or something like that. Yum. It doesn’t get much better than a bike ride with friends through beautiful countryside with ice cream as a reward. What a great story and great photos (including of you)! I envy you that day. Gorgeous flowers. And that is a pretty spiffy Cannondale too. A sea of sunflowers–how pretty! Lovely photos all around and so nice to see you finally close up! It’s always nice to be able to put a (smiling) face to a name. I think the best I could do here would be to share a sea of corn–not all that exciting. I might be willing to cycle if I knew there was ice cream at the end of the ride. 🙂 Thanks for sharing the photos. Lovely to see a pic of you, Dorothy! Looks like you had a fabulous day. We had a wonderful time with you — thank you for making the trip out with us! And thanks again for riding back with me. Those sunflowers are truly unbelievable, in the photos and in person. Van Gogh would have had apoplexy! What a nice picture of you, Dorothy! And the sunflowers are gorgeous. Sounds like you had a lovely day. Thanks for sharing the wonderful photos! I love sunflowers. A whole field of them must be breathtaking! Lovely, lovely photos. I can’t imagine a nicer day – long bike ride (or walk in my case since I’m hopeless on a bike) with a sweet treat at the end. Reminds me of when I slammed on the breaks…of the car…to get shots of these by the road near Saranac Lake, NY. earlier this year. I wonder if it is a bad sign that I spent more time admiring the photo of the bike, than the beautiful ladies or the pretty flowers. I had to sell my Lemond when I moved to Japan and replaced it with a mid-range Giant here: it’s just not the sasme. Sounds like a great day. I thought this kind of scenery can only be found in Provence, France! Also, it’s just wonderful now that I can relate the words with a face… a bold and beautiful gesture. Thanks for not just sharing your thoughts but yourself with us, Dorothy! Great stuff–photos, bike, fit biking ladies, sunflowers–great link to the Connecticut farm. Seems like such a fantastic idea: planting acres of sunflowers just because… well, they’re incredibly beautiful, for one thing. Great photos, too. Beautiful flowers and super fast looking bikers! Now do we get to see a pic of your bike, too? 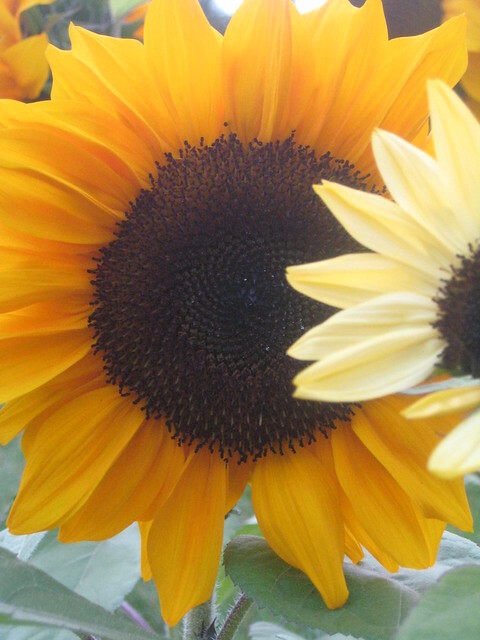 I love the way sunflowers turn their face to the sun–I’ve always thought that would make a terrific metaphor. Nice photos–sounds like a wonderful day. Aaaaw what a couple of cuties…..flowers, bikes, knitting and such. Gorgeous (both you and the flowers)! The picture of you is great! And the sunflowers are stunning – I would love to bike ride in that area. Frances — thank you! I actually have the exact same Cannondale, just in a much smaller size. Danielle — I’m not entirely sure why I didn’t want to post a photo of myself so I finally just decided to go ahead and do it. And yes, ice cream is a great motivator! Charlotte — thank you! Yes, we did have a great day. Debby — it was so much fun riding with you! It was a nice conversational pace, and conversation is really what I wanted. Table Talk — I would have loved to see his rendering of the scene! Litlove — thank you! And yes, a lovely day it was. Stefanie — it really was breathtaking, and it was actually several fields of sunflowers, so doubly or triply breathtaking! Verbivore — walking would have been a great way to take in the scene. I’m very grateful to our friends for showing us a place we wouldn’t have found on our own. Nigel — that’s a lovely photo to slam on your brakes for! Lily — yes, what a perfect picture of summer, isn’t it? Bikkuri — I don’t blame you for admiring the bike — a white bike is a lovely thing, even if it’s a huge pain to keep clean. Arti — well, thank you for the kind comment! My friend described the scene as just like the south of France, which definitely sold us on it. Emily — oh how fun to buy bikes! I hope you have wonderful rides on them, sunflowers or no. Zhiv — yeah, it’s a great idea, and cool that they devote proceeds to charity. It seemed like a popular place, so they must be earning a decent amount of money. Bardiac — well, my bike is exactly the same as Hobgoblin’s, except lots of sizes smaller. We didn’t set out to get matching bikes, but the shop had a discount, and that white Cannondale was our one choice. Boy is keeping a white bike clean very difficult! JaneGS — a terrific metaphor indeed! Yes, it was a memorable day. Courtney — it was great, and I hope to get back one day. I’m very grateful to our friends for inviting us on the trip. In a bouquet, or as a decor motive, I do not like sunflowers. But, when I see them in nature, especially a field full of them, I can’t help but smile. They are such a ridiculous flower — thick stemmed, too tall, weed-like leaves — yet when you look closely, they are absolutely beautiful: hundreds of seeds in the center arranged in concentric circles; in a field, bowing their heads; the magnificent bright color. How could it not make one happy to look at such a wonderous thing? Glad you had a fun ride and were able to see the flowers, have some ice cream, and spend time with friends. Perfect summer day. Thank you Iliana! I’m glad I decided to post the photos, given the positive response I’ve gotten! Cam — yes, I can see why you might not want them in a bouquet. But in a field they really were lovely. I love your description of them!